"After four years in business, Seaside Construction was recognized by the Greater Charleston Chamber of Commerce... The quality component is reflected by Crawford's own extensive experience in Lowcountry construction, including his certification in master carpentry, roofing and painting..."
As a full service provider of construction services, Mount Pleasant-based Seaside Construction, LLC has developed the resources and expertise to handle a complete range of residential and commercial building projects. Managing member, David Crawford says, "We can handle anything from a modest repair or home remodeling project to 10,000 square foot new residence. The Seaside team works with the client from the start, translating the idea into a working plan and budget, and delivers not only a finished product, but also a manual covering on-going maintenance. You can say we are there from concept to completion." After four years in business, Seaside Construction was recognized by the Greater Charleston Chamber of Commerce with a prestigious "Emerging 10" award for its outstanding growth record. The company has based its business strategy on delivering superior quality while retaining affordability. The quality component is reflected by Crawford's own extensive experience in Lowcountry construction, including his certification in master carpentry, roofing and painting. To further assure quality, Seaside hires skilled craftsmen rather than relying on subcontractors whenever possible. Seaside emphasizes innovation and technology to achieve the "affordability" side of its success equation. Modular housing offers a cost-saving alternative to traditional construction. The homes are manufactured under ideal conditions with strict quality control, and Seaside works closely with manufacturers to assemble the homes and make sure they meet and exceed all local and regional building codes. Seaside also handles remodeling and expansions. Whether it is a redo of a kitchen or master bath or a whole new wing, Seaside will work closely with the owner to design a solution that meets both dreams and budgets. The firm works with local architects, engineers and interior designers to bring in as needed or will happily work with those of the clients choosing. A similar approach can be taken with the exterior of the home, from new roofing or siding to patios, landscaping and water features. For those who have purchased their dream property, Seaside will oversee the construction of their custom home. As with all their projects, the team will meet with the owners and other building professionals to draw up the plans and cost estimates. A detailed budget is presented at the second meeting and the owner is kept informed on progress and costs through in person meetings. 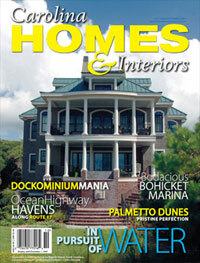 One of Seaside Construction's recent projects has received a lot of attention from Charleston media. Crawford was selected by owner Lee Richardson to be general contractor for his 5,000 square foot home in the King Street Lofts. Home of Edwards Department Store on upper King Street in the 1940s, this multi-level city residence rivals anything found in Manhattan today. Unique features of the home include a raised gourmet kitchen, which serves as the centerpiece of the first floor, and an office, media room and temperature controlled wine room on the midlevel. Probably most challenging for the Seaside team was the revamping of the penthouse veranda. This 5,000 square foot space was reengineered to support a lap pool, several gazebos, fountains, planters and a hot tub. David is proud of the progress Seaside Construction has made since its launch in 2000. The firm recently won a coveted Prism award from the Charleston Trident Home Builders Association. His team has grown to over a dozen highly-committed employees; and their commitment to quality and value has built a foundation for future growth.